The NFL is one of America’s biggest sports, and one of the most well-known players is #13 on the New York Giants, Odell Beckham Jr. But NFL fans barely even know the New York Giants before Saquon Barkley, the star rookie running back, came onto the team. That isn’t to say they were irrelevant, but were, for lack of better word, declining. With Saquon however, The New York Giants have projected themselves out there as potential contenders in the future despite missing the playoffs yet again. The Baltimore Ravens also have a new star rookie — Lamar Jackson. But unlike the Giants, they’ve made it to the playoffs with that rookie and a super bowl winning veteran quarterback, Joe Flacco, stashed behind. But, they faced one pressing question in the playoffs: who do we start? 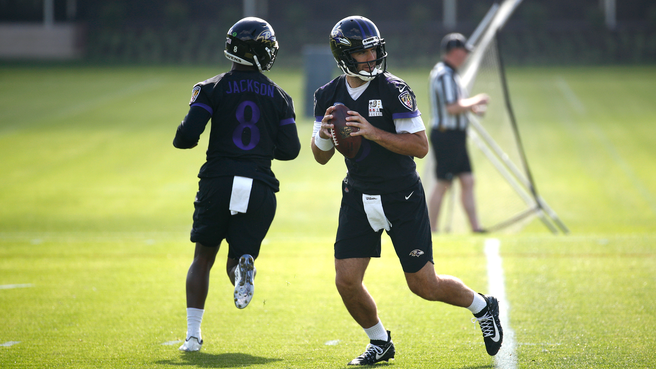 The play-off experienced Joe Flacco or the hot rookie Lamar Jackson? The Ravens went with Lamar Jackson who led the team to the #1 seed in the AFC North. After a subpar first half, Jackson performed phenomenally and led the Ravens to an almost mythical comeback, falling short by just one touchdown. And a recurring question is would the Ravens have won if they had started the experienced Joe Flacco? Let’s take a look at their stats. Rookie Joe Flacco back in 2008 made the playoffs as Lamar Jackson did. However, he posted awful stats. According to Pro football reference, he averaged a 55.6 in passer rating, peaked at 86 and hit rock bottom at 18. Passer rating is a system that takes in most stats like touchdowns, interceptions, completion rates and whatnot and converts it all into one number. For example, the game where Flacco received an 18 in passer rating, he threw three interceptions, zero touchdowns, and only completed a little bit more than 40 percent of his passes. But moving forward, Flacco grew as a quarterback and even picked up a Superbowl for Baltimore in 2012. However, he’s made it clear that he’s not consistent. After his amazing season in 2012, he tripped in 2013 and posted his worst season, throwing more interceptions than touchdowns. Thus, his inconsistency makes him untrustworthy as a quarterback just to throw on that hasn’t played in the 2018 season since around the 9th game of the year. As an organization, I believe the Ravens made the right decision giving their rookie Lamar Jackson more experience, just like Flacco in 2008. Though he does have the experience, the Los Angeles Chargers had arguably one of the top 5 defensive lines that pressure the quarterback exceptionally well. With a star-studded cast that included Joey Bosa and Melvin Ingram, Joe Flacco would have felt the pressure and made mistakes like Jackson. But Jackson could run. Jackson could scramble out of the pocket and make devastating runs that would pressure linebackers like Ingram from blitzing and being aware of the run. Lamar Jackson won 7 out of the 8 games he started — an incredible stat for a rookie. And I believe it is time for the Ravens to hand the keys to him and work out a trade for Joe Flacco. Because it is evident that the Ravens would not have won if they started Flacco either.